Rachel Macy Stafford is a certified special education teacher with a Master’s Degree in education and ten years of experience working with parents and children. In December 2010, this life-long writer felt compelled to share her journey to let go of distraction and grasp what really matters by creating the blog Hands Free Mama. Using her skills as a writer, teacher, and encourager, Rachel provides readers with simple, non-intimidating, and motivating methods to let go of distraction and connect with their loved ones. Rachel’s work has been featured in USA Today, TIME.com, MSN.com, PBS.org, The Huffington Post, and Reader’s Digest. Her blog currently averages one million visitors a month. 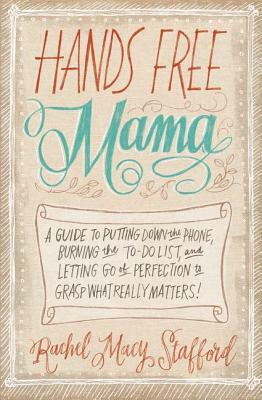 Her first book, Hands Free Mama, recently became available.